As the end of Daylight Saving Time approaches (Sunday, November 4), running in the dark will again become a factor for early morning and evening Gazelles workouts. 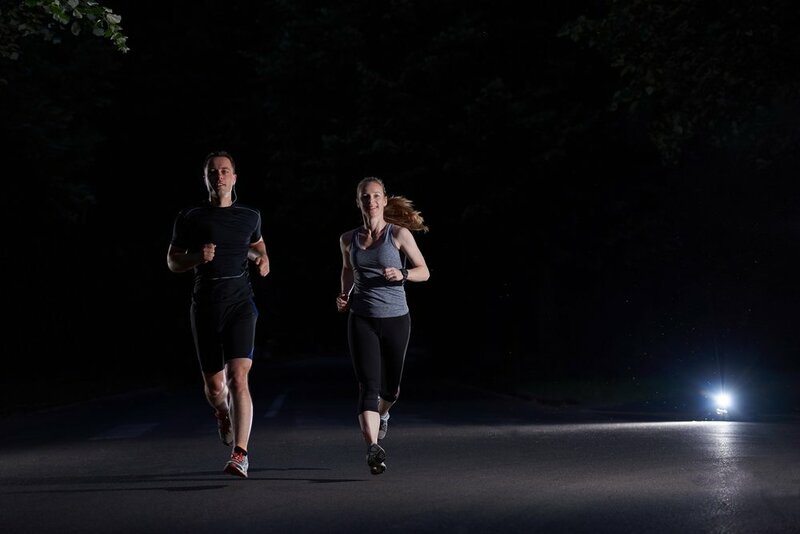 Running in the dark can be enjoyable, but there are obvious safety issues to consider, including tripping hazzards, visibility and an increased possibility of personal attack. Wear bright and reflective clothes or small flashing light. Even if you're on the trail, you want to wear light colored clothes so other runners can see you. Of course if you're out on the roads, it's even more important so cars will see you. Run in well lit areas, especially if you're on roads or places where there aren't a lot of other people. Run familiar routes. You already know the terrain and what tripping hazzards to watch out for. Running in the dark is not the time to try a new route. Run with friends—there's safety in numbers. Two or more people knowing a route can also remind each other where there are tripping hazzards. Leave your headphones at home. Not being able to hear things around you is a huge disadvantage when running in the dark. Pay attention to your surroundings and pay attention to your "gut.” If something makes you uncomfortable, don't ignore it. Turn around or go a different route or worst case, cut your run short. Better to have a short run to run safely another day. Run against traffic when running on the roads or the sidewalk. Always assume that a car has not seen you unless you can see that the driver has acknowledged you. Wearing a hat or visor can help keep you from getting a branch or stick in the face. You're looking down more to see where you're putting your feet—don't forget to look up to make sure you don't run in to something. If you want to use a running light, shine it directly on the ground in front of you. If you don’t, runners coming towards you can be easily blinded by your light. Red or green lights are better than standard white light on the trail and try to use the lowest setting. If you run on familiar routes, you should be able to see the shadows of terrain changes and use that with your familiarity of the route to not need a light. Consider carrying a whistle, pepper spray, or other personal protection. Be safe out there this fall/winter and always remember to Run With Joy!